I had so much fun participating in the Blogger gift exchange this year hosted by Jill! My awesome Secret Santa was Holly over at Things2Write. If you get a chance, hop on over to her blog and follow her. She included neon colored note cards that were spiral bound (these will be perfect to jot down those track workouts I have planned); funky paperclips, some Fudge Brownie PowerBar protein bites (cheating without the guilt! ), some sunscreen (so needed in the Texas sun), some bowl scrapers and a cupcake filler, because I love to bake. Absolutely awesome! Thank you so much Holly! I really appreciated the gift and was very thoughtful of you to go to the trouble of finding the little things you knew I'd like! I hope everyone had a wonderful Christmas! 2012 is going to be a fun year for triathlons for me, but I'm going to admit, I wasn't even sure there was going to be a 2012 race season. After tackling Ironman Texas in May, my feelings on racing were all over the place. Part of the fun in training for me was to see if I could go further. It was the excitement of the unknown. Will I be able to finish my first Olympic distance? My first 70.3? My first Ironman? 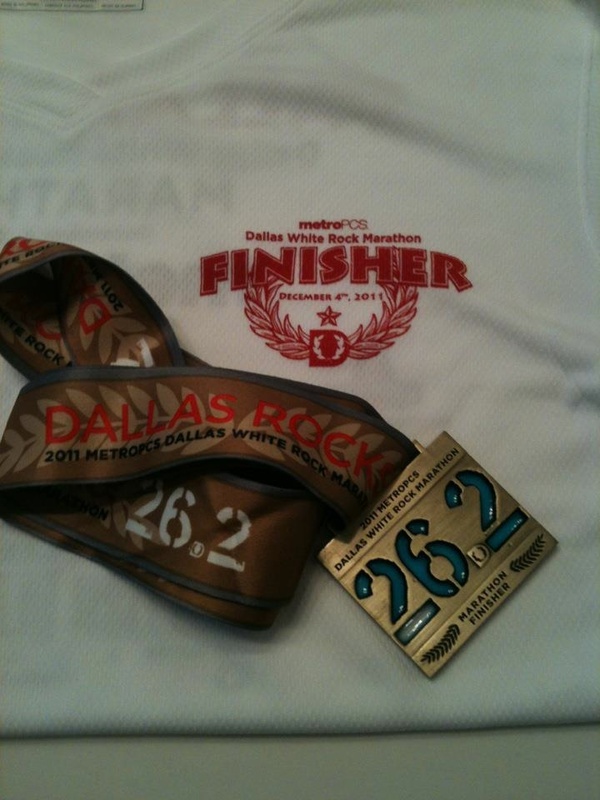 So, being the endurance junkie that I am, I decided to sign up for a double marathon. That's taking place on New Year's Eve and New Year's Day. 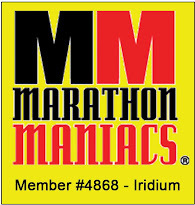 As, I've mentioned before that punches my ticket to be an official member of the Marathon Maniacs at the Iridium Level. Whoot! But, it still left me questioning where I was going with the rest of my season. 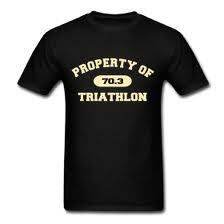 The 70.3 distance really seems to suit my strengths and is more manageable for training for me. So, my (tentative) big goal is to qualify for the Redman/ Halfmax Long Course National Championships in Oklahoma City at Ironman New Orleans. However, if for some reason I can swing it, I would quickly drop that to race the REV3 Cedar Point (Full! ), which just happens to be on my birthday! There's also a full distance in Kerrville, TX in October. That could work. ;) I would do another full in a heartbeat. But, we'll see. I think the smart plan is to stick on getting faster and stronger at the 70.3 distance. Holiday deal... well, maybe not so much. I know we're all looking for great deals during Christmas and sometimes the holiday rush has us buying things on sale that might not be as good of a deal as we thought, but this one takes the fruitcake. 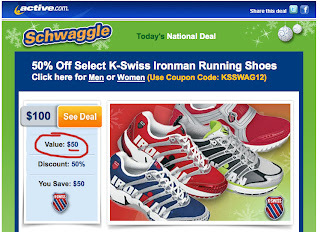 Today only, you can take advantage of this awesome Schwaggle deal! 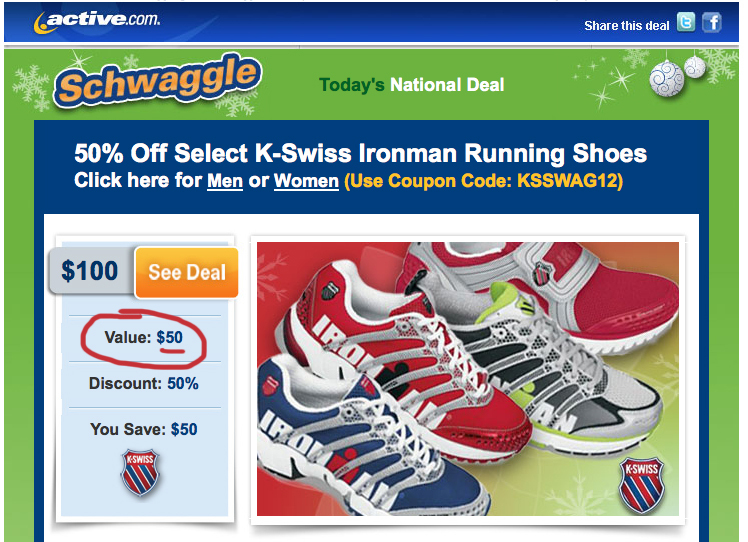 For $100 you can own a pair of K-Swiss Ironman Running Shoes, valued at $50. That's a 100% markup! Buy! Buy! Buy! Sadly, I feel like this same tactic is used when signing up for Ironman races. But, I do- so don't consider me a hater. :) Happy shopping! I did it! After 11 years and 5 marathons, I finally EARNED a PR. Despite this course being considered, "fast" - the weather made it by far the most difficult I've ever run. But before I go any further, I want to commend the race directors, sponsors, police officers, volunteers and spectators for putting on an amazing race. While the weather was out of their control, I can't thank everyone for the encouragement, support and keeping us safe out on the course. I've seen grumblings on their Facebook site and I have to say overall the race was a great experience and Dallas should be very proud of this world-class event. My mom was amazingly supportive, as always, and I picked her up at 4:30am to head out to Fair Park. After sitting in traffic last year for almost an hour, I was determined to get there early. It paid off and we had premium parking. After chatting for a bit, we both fell asleep. Thank goodness I got a text message at about 7:15am that startled us both awake. The race started at 8am! I couldn't believe I could have almost missed the start! The weather was a chilly 47 degrees (it's Texas- we don't deal well with the cold), raining and windy. Throughout the morning, it dropped 5 more degrees. I could see my breath, I was soaked and frozen. The hood on my poncho was full of water and every time I tugged on it from around my neck, it would pour down my back. Many of the roads were flooded and the potholes on the course were covered with water, so you didn't realize they were there until you were ankle deep in water. My socks sloshed and even the generous amounts of Aquaphor that I used on my feet couldn't keep my shoes from rubbing off a huge chunk of skin off the back of my ankle, leaving my sock and shoe covered in blood. I didn't realize this until after I was finished, because my feet were so frozen. Bonus! I had tried to stay as positive about the weather, but by about Mile 18, the rain picked up and it started to play with my mind. I felt pretty alone out there and was ready to be done. The pace group that I was trying to keep in front of, passed me looking strong. All I could think about was having a warm meal, taking a shower and getting into some warm, fuzzy pj's. I refused to look at my watch until Mile 25. The clocks on the course were off because of the rain, so I had no absolutely no idea where I was in regards to time until that moment. I felt like I was on track, but I wasn't sure. When I finally let myself check my watch and realized that I was going to easily PR, I was ecstatic. I kicked it into high gear and ran the last mile in as fast as I could. I'm going to be honest, despite the PR, it was a hard race. I don't think anyone could classify a marathon as easy, but I'm pretty nervous about the double marathon coming up. The day after White Rock, I hopped on the treadmill and ran 3.1 miles and then did a recovery swim. My legs felt better than expected, but I'm not quite sure how 23.1 more miles are going to feel. Yikes! 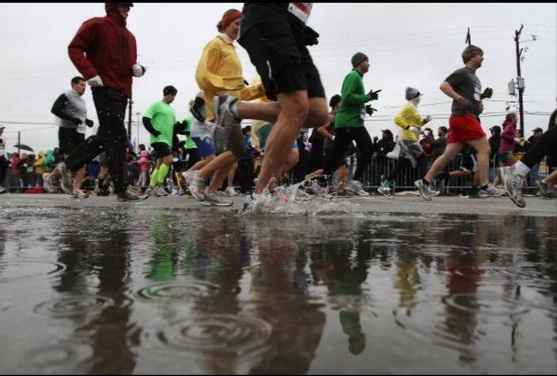 - Of the 4530 who finished, 38% were Women and 62% were Men. - I was ahead of about 35% of men runners. This weekend was a weekend of amazing PR's for a lot of people, including Lesley at RacingItOff, Jason at CookTrainEatRace, and his wife Karen, and a big congrats to my co-worker Christi who ran her first marathon and did amazing! Way to go everyone! Thanks again to Team Aquaphor for sponsoring me. I had many thankful people accepting samples to keep them from chafing with their wet clothing!